Quick Links: List of American Bean-to-Bar Chocolate Makers, List of Canadian Bean-to-Bar Chocolate Makers, List of UK Bean to Bar Chocolate Makers, The Raw Chocolate List, Organic & Fair Trade Chocolate List (U.S. & Canada), Soy-Free Chocolate List, Dark Milk Chocolate List, List of Specialty Chocolate Retailers, List of No Cane Sugar Chocolate, List of Cocoa Bean Suppliers, How to Temper Chocolate, Chocolate Recipes. I was spending a little time "off island" the other day, and made my way to Sudbury, Ontario, the nearest city to Manitoulin Island. I made my way into Costco for a few business supplies. As soon as I passed the snack aisle, I was surprised to see - not only a new product on the shelves, but a ChocXO product. ChocXO has been actively promoting themselves as a bean-to-bar chocolatier (they write 'chocolatier' rather than 'maker' I guess because they focus more on the treat market rather than just single origin bars like many other bean to bar chocolate makers). I have always found ChocXO to be a bit confusing. I heard and read that they were a bean to bar maker, but in Canada or the US I could not figure out. They have a Delta, BC (Canada) address on their website, but I thought they started in California, or have a production facility there and one in Canada? Plus, the website uses the words 'color' and 'flavor' without the 'u', leaving me to believe it is American-based. The website no longer gives any indication verbally of the origin of the company, likely to let people believe it can be made in their local country no matter which side of the border they may be on. What worries me for the craft, bean-to-bar chocolate community, is that clearly to achieve a price of $12.49 at Costco, there must be some large equipment and mass-production capabilities in place. This low price makes it hard for the average small bean-to-bar chocolate maker to explain why their price is six times the amount of ChocXO's. I calculated what my bean-to-confection price would be (based on weight) and this bag would retail at $60 for a small maker like me. Below that and I could not cover labour cost or overhead; I would lose money. The growing group of craft, bean to bar chocolate makers take at least a week to produce a bar of chocolate from start to finish (that's if they don't age your chocolate before moulding it, which adds weeks to thee process). And with small equipment, and carefully sorting and roasting beans by hand, plus ensuring beans are fine-flavour, chosen from farms and farm co-ops applying sustainable methods and prices high enough for the farmers to earn a living, the whole process on a small scale is very expensive. But what the customer gets for that higher price is: knowing where the beans come from, being able to taste flavours of specific 'terrior' depending on where the beans grow, and knowing that a chocolate maker has put all of his or her passion into bringing out the most interesting flavours of the beans in the way that they have personally interpreted them. All this makes the experience for the taster unique for each brand, each year and each harvest time for the beans. 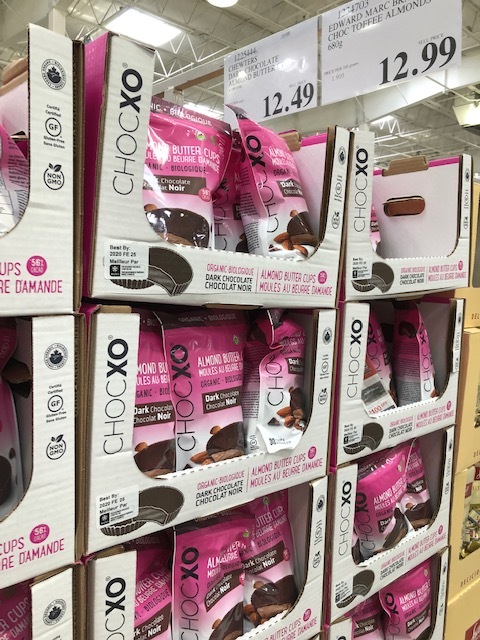 So all that said, I am happy for ChocXO for making it into Costco. This is a great leap for them as a business. 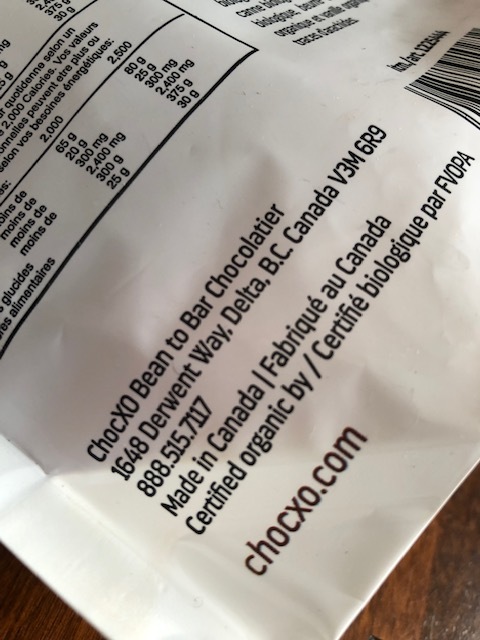 I am just concerned that by promoting the 'bean to bar' message on their packaging, it makes it harder for the small makers to educate their customers on why ChocXO's Costco price is so different from their own. 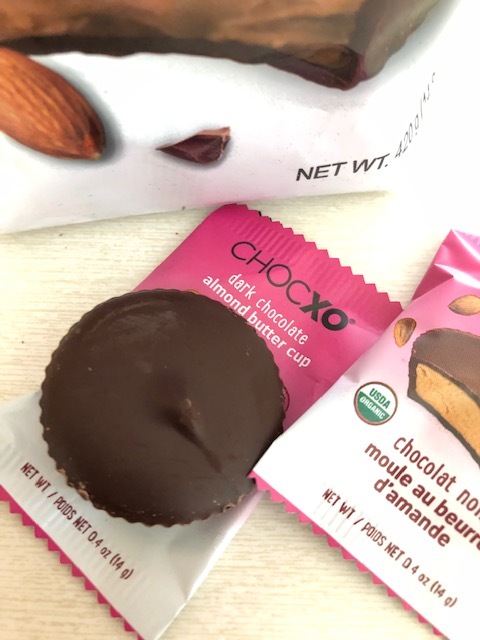 As for ChocXO's product itself, I like the main principles of what they stand for: 100% organic and no artificial sweeteners, colours or flavours, and non-GMO and sustainable sourcing. These have always been my principles in my chocolate business and in my eating habits. I would gladly feed their products to my children as an alternative to a standard commercial chocolate candy bar, like Mars or Reese Peanut Butter Cups. And for those who cannot have wheat, they are also gluten free. The Almond Butter Cups are tasty, and leave you wanting more. They are a bit on the sweet side being made with a 56% 'dark' chocolate (which means that chocolate around the almond centre contains 44% sugar). The centre doe not taste quite so sweet yet balances the chocolate very well. There is a good amount of chocolate also on these cups, which certainly satisfies a chocolate craving, but yet provides a filling snack when one is a bit hungry. 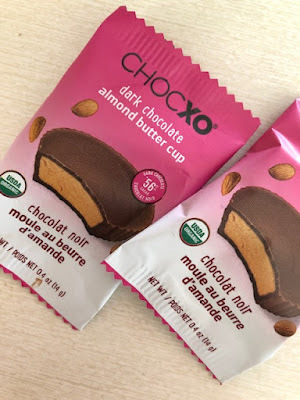 So check these out at Costco if you are into Almond Butter Cups, or looking to kick your commercial-Reese-Peanut-Butter-Cups-hydrogenated-oil-and-artificial-flavour habits and want something a little 'healthier'. Just be sure to hit up Costco on a full stomach first! A few months ago I was handed a package of bean-to-bar chocolate made by a Russian company. This is my first experience with Russian craft chocolate, so I was curious. I thought I was about to eat a bar of chocolate, but what I found inside the wrapper was a lovely package of eight different chocolates. Each chocolate is made from a different cacao grown in different regions of Peru. 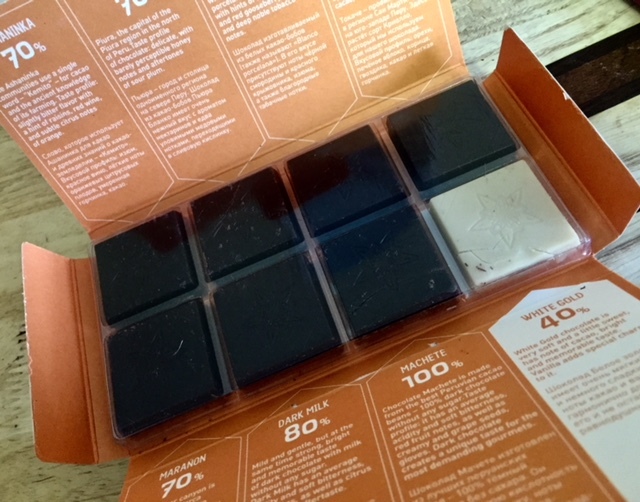 The box also included many single region 70% to 75% dark chocolates, one lovely, not-too-sweet white chocolate, and an 80% dark-milk with no sugar in it at all (much like Zotter's unsweetened 70% milk chocolate 'dark style' and Hotel Chocolat's 80% Supermilk, two dark milk chocolates with just milk powder, cocoa beans and cocoa butter, and no sugar added). This 80% was very bitter, and definitely took some getting used to, but certainly a little easier on the palate than a pure 100%, thanks to the milk content. If you like to taste a variety of single origin chocolates in one sitting, or over the course of a week or month, this tasting package may be the perfect thing for you. It was fun to taste the variety of flavours of cocoa beans from different regions of Peru. I had some favourites, and some not-so-favourites, but I will let you decide for yourself which regions you liked best. What was most exciting about this product was the origin and taste discovery experience inside. 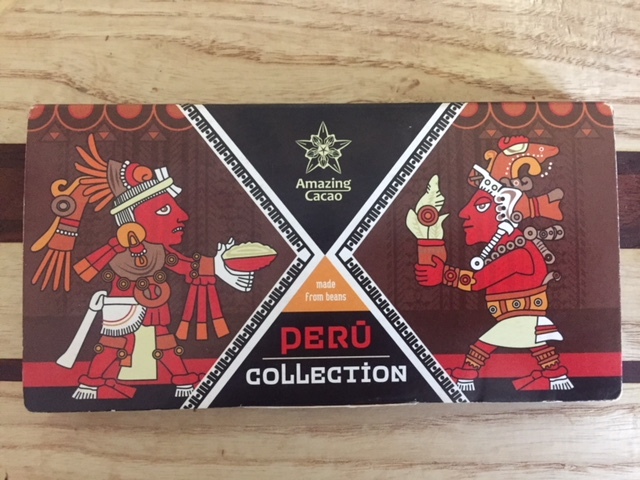 There are so many single origin chocolates coming out of Peru and made from Peruvian cocoa beans now, that it can get confusing and overwhelming to pick a favourite region. This box offered a lovely overview of Peruvian cacao and some of the cacao growing regions in the country. 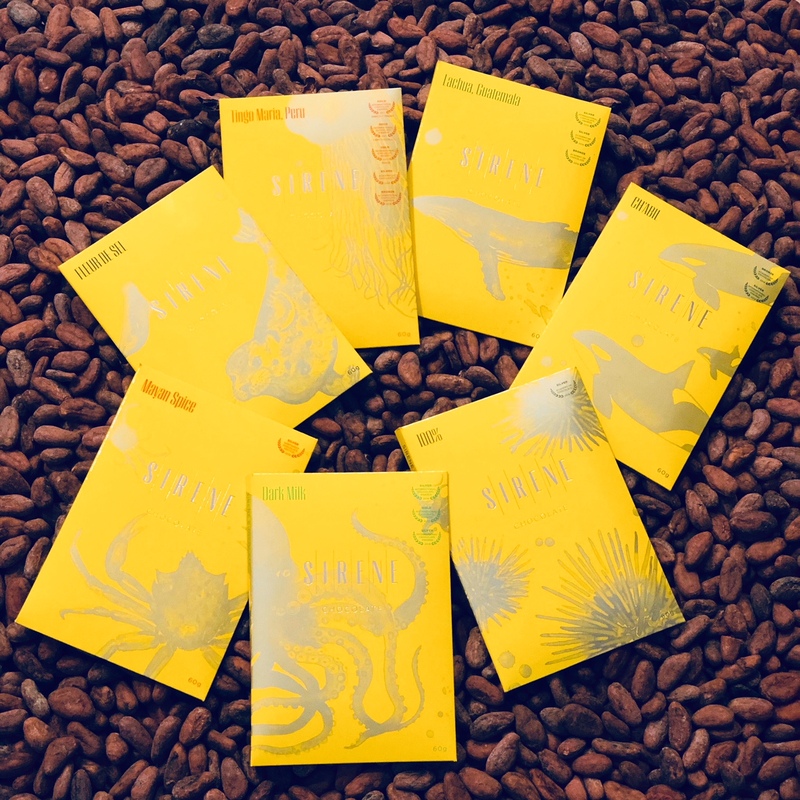 You can learn more about Amazing Cacao on their website: http://www.amazingcacao.com/about They also import to Russia organic ingredients, such as green coffee beans, fine organic cacao beans and cocoa butter and cane sugar. As European chocolate makers, chocolatiers and chocolate lovers are getting ready for Chocoa in Amsterdam later this week, I am still reminiscing about The Winter Chocolate Show in Toronto a few weeks ago. It was much smaller than the beast of an event Chocoa is, but it was exciting none-the-less for Canadian chocolate makers and chocolate lovers because it was the first Canadian bean-to-bar event of its kind. Organized by Erik of Desbarres Chocolate and Paola of The Candy Bar Toronto, the festival was a one-day event that brought together 16 Canadian bean-to-bar chocolate makers from all across the country (really, all across - from Nova Scotia to Victoria!). Chocolate lovers and connoisseurs poured through the doors all day long into the small venue at the Enoch Turner Schoolhouse in downtown Toronto. Look at all the beautiful bean to bar chocolate that I brought home from Toronto! Akesson's came from The Cheese Boutique, Omnon from Pusateris and Chapon from The Candy Bar. The rest are all the wonderful Canadian bean-to-bar chocolate that was found at The Winter Chocolate Show! I was there, not as a chocolate lover this time in the way that I annually attend the Northwest Chocolate Festival in Seattle, but as a chocolate maker. I've been quietly making chocolate for quite a few years now as part of my 10-year old confection and pastry business, but last year I finally made the decision to sell my bean-to-bar chocolate beyond the local market of Manitoulin Island and Sudbury. And I was finally brave enough to send a few of my bars off for some of the international awards (and won a few too!). So now that I am venturing out into the world beyond Northern Ontario, I was excited to have a chance to participate in a bean-to-bar event so close to home (ha ha, it took me 8 hours in a snowstorm and freezing rain to get there, but it was still driving distance!). The day was so much fun. I was surprised to see how many people knew about bean to bar chocolate (although I shouldn't have been since Soma has been educating customers for years in Toronto), and many looking for interesting single origins, flavour combinations and 100% dark chocolate. We had a few bloggers out, including Christie from @twogirlschocolate and Cyndi from @canadianchocoholic, and Grand Jury judge for the International Chocolate Awards, Shirley Lum (@schocolatemagic). The wonderful craft chocolate expert and educator Karine from www.misschoco.ca joined us from Montreal. And I got to hang out with my business partner Trish and my best friend Katherine all day long, talking chocolate with a lot of passionate people. Can you spot Miss Choco and @Canadianchocoholic? We also had the privilege of wonderful Juan Gonzalaz from The Mexican Arabica Bean Company wandering around the show all day, talking to people about his beautiful cocoa beans from Honduras, Mexico, Peru, Papua New Guinea and soon, Thailand. Juan is a good friend and excellent partner to bring fine flavour cocoa beans direct from the farm to Canadian chocolate makers like myself. And look at that beautiful branding by Desbarres in the backgound. 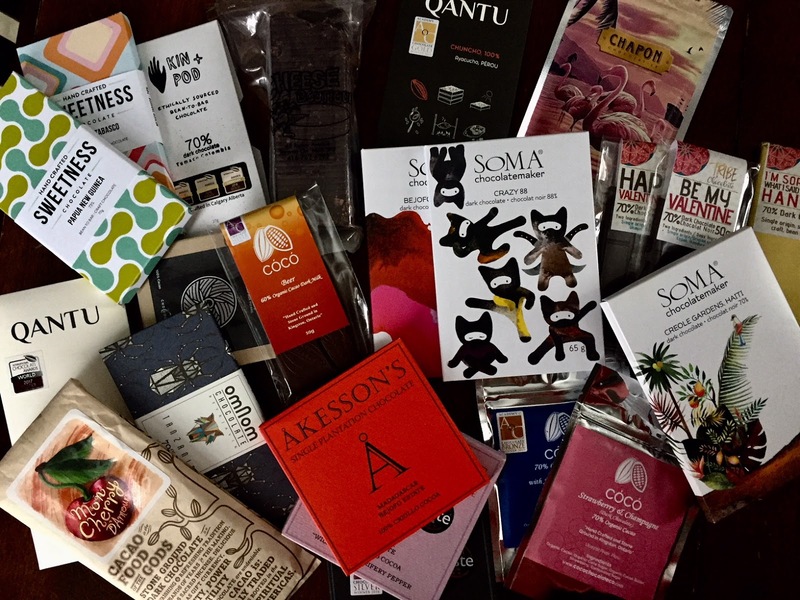 As for the vendors, we had a variety of chocolate makers sampling their products, from stone ground chocolate like ChocoSol, to super smooth like Soma Chocolatemaker, both from the Toronto region. David and Cynthia from Soma are in the middle of a big project (moving to a much larger bean to bar factory in Toronto) so it was great that they joined us. Desbarres Chocolate had all their wonderful award-winning flavours, like that delicious black pepper and cardamom bar that I have been thinking about since I first tasted it in the Fall. Taylor Kennedy flew in all the way from Victoria, B.C. with his award winning chocolate bars and he surprised us all with the launch of new packaging. Still with a lovely shade of yellow, this new packaging wowed with a theme of wildlife native to the seas surrounding Victoria. 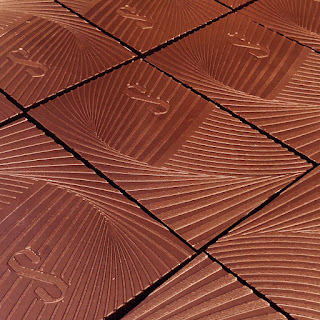 The chocolate bar mould was even re-designed with a stylized wave. 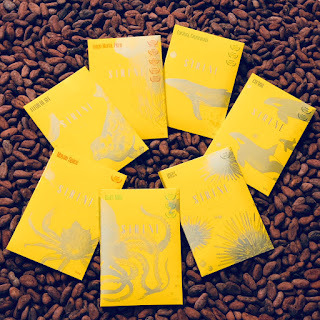 What a beautiful way to showcase the origins of Sirene Chocolate. Congratulations to Taylor on a job well done! Other notable mentions were Coco Chocolate Company's Strawberries and Champagne bar, with freeze-dried strawberries and carbonated sugar for a fizzy effect, Sweetness Chocolate's artistic single origin bars with splashes of colourful cocoa butter, Soma's beautiful valentine's day chocolates, Palette de Bine's new large gorgeous pack of bars with a beautiful illustration of Mont Tremblant, and Tribe Chocolate's packaging with the cute saying "I'm sorry for what I said when I was hangry." Petite Patrie flew in from Nova Scotia and brought some good single origins and an interesting vegan chocolate. Kin + Pod represented Calgary by show-casing its award-winning Tumaco bar. I also featured my new Buttermilk Gianduja bar, which is a creamier version of the award winning Buttermilk 48% with hazelnut butter and sea salt added. It is quite delectable. Next year we hope to see the event back and perhaps even bigger! What a great way to spend a cold winter day in Toronto. I hope to see you there next year! Are you still tackling your New Years Resolutions to be healthier in 2019? And is one of those resolutions to reduce or cut out cane sugar? If so, making hot chocolate can be no easy task since most hot chocolate mixes have added sugar in them. Even gourmet 'drinking chocolate' can be full of sugar. But fear not, hot chocolate with alternative sweetener is easy to make at home with an unsweetened chocolate bar and your healthy sweetener of choice, whether it be stevia, xylitol, coconut sugar, maple syrup or yacon syrup. Although it is quick and simple to make a hot chocolate out of pure chocolate, it does take a bit of technique when it comes to pouring and stirring to make one that is smooth, with no bits of chocolate floating in it, which maximizes chocolate flavour. The key is to start out by making a ganache, then add all the milk (or coconut milk for a vegan version) that you want. I liked it, but it was a little mild in the single-origin cacao flavour department for me. I knew I was never going to finish it as an eating chocolate. But I thought - because it was low in acidity and any overwhelming fruity or pronounced flavours - it would be perfect for a hot chocolate. And in the end, it was! 1. Place milk in a small saucepan on the stovetop. Heat on medium, stirring often, until steaming. 2. While the milk is heating up, break up your chocolate into 1/2" pieces. Place chocolate in a small-to-medium sized microwave-safe bowl. Add 3 tbsp of the milk to the chocolate. Microwave for 35 to 40 seconds. Stir until smooth. 3. Add the sweetener, then add a little bit more of the hot milk (about 1/4 cup) and stir in until smooth. Add the remaining milk and vanilla extract and stir with a spoon or whisk until smooth. 4. Pour 1/3 of the mix into one mug and enjoy immediately. Cover the remainder with plastic wrap and refrigerate until ready to consume (no longer than three or four days though). Warm up in a mug in the microwave or in a saucepan and enjoy! -add more skim or low fat milk, the natural sugars in the milk will more than make up for any added sweetener and reduce the bitterness by quite a bit. -add a touch more real vanilla. Vanilla certainly makes chocolate taste sweeter than it is, and it also works the same way in hot chocolate. -even if you don't like the taste of stevia and you've chosen maple syrup or honey or some other sweetener with more calories than stevia, you can still add a drop or two of concentrated stevia without it adding the taste of stevia. Anything over that amount and you might start to taste the stevia, but supplementing your maple syrrup with just a bit of stevia will not affect the flavour too much. If you like the taste of stevia, go ahead and use it entirely as the sweetener, but remember not everyone does so if you are serving to others, keep that in mind. -blend in a half of a ripe banana and don't add any sweetener. This will become a banana-flavoured hot chocolate, but hey why not? It's a meal and a treat all in one! -go darker. Cut the sweetener to half of my recipe, or don't add any at all. You will eventually become used to the bitterness if you have decided to cut all sweeteners from your diet. Happy New Year my chocolate-loving friends! As another year passes, I notice how much more choice we have in chocolate. With the rapid and massive growth of the bean-to-bar chocolate industry, any percentage of cocoa solids and flavour combination can now easily be purchased - if not in person, certainly online. And so, each January since I started an annual tradition of cutting back the sugar in the chocolate I consume, and eating only very low-sugar chocolate (we're talking 80% to 100% dark chocolate) for the first two months of the year, my goal has become easier to reach. When I first started this 'unsweetened' tradition in 2012, I did it to get my palate accustomed to 100% dark chocolate so I could begin to enjoy it. Well, that plan worked and now I can not only easily jump between a white chocolate bar and a completely unsweetened cocoa liquor without so much as a cringe, I also find myself hoarding the very darkest of bars and tucking them away for the winter months, happily looking forward to my unsweetened chocolate time. But of course one need not jump headfirst into darkness, but rather ease in tentatively to become accustomed to the dark. So I thought I'd start by some 95% dark chocolate bars by TAZA CHOCOLATE, a bean to bar chocolate maker from Somerville, Massachusetts. 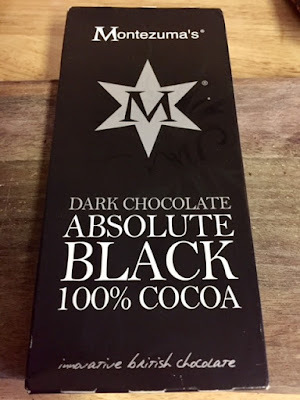 In November at the Chocolate Maker's Unconference, I attended a few sessions lead by Alex Whitmore, the charismatic founder of TAZA, and was both surprised and impressed to hear that TAZA's number one selling product is a 95% dark chocolate bar called Wicked Dark. With only 5% sugar, the bitterness level of this bar has in the past been too much for most chocolate lovers, until recently. With a renewed interest in cacao and much talk of Keto and Paleo diets, very dark chocolate has entered its heyday, and the average population is beginning to try it. Because of the popularity of Wicked Dark - or at least I assume this to be the reason - TAZA also has introduced the Wicked Dark 95% bar with Toasted Quinoa. So I purchased both bars online, arriving back from Christmas Holidays to find them in a package at the post office. Perfect timing for my unsweetened chocolate month! Wicked Dark truly is the perfect name for these chocolate bars. They are bitter, in nearly a wicked way. But with the crunch of the stone-ground chocolate, they have a snack-like quality, and just enough crunchy sugar to make you not feel as though you are missing out on a chocolate experience. Taza's focus, as they mention on their website, is that cacao is complex in flavour, so they minimally process it so the flavours can "shout loud and proud". These chocolate bars certainly do that. If you think you can go wickedly dark, learn more on Taza's website at: www.tazachocolate.com or if you are in Canada like I am, you can buy Taza bars online at www.naturamarket.ca. The Wicked Dark bars by Taza are certified organic, non-GMO, direct trade, gluten-free, dairy free, soy free and vegan. The ingredients are: organic cacao beans, organic cane sugar, plus puffed quinoa for the toasted quinoa bar. Stay tuned for more talk of unsweetened chocolate bars and low- or no-cane sugar chocolate in the coming two months! Happy Chocolate Eating! Cacao Juice Now Available in North America - Pure and Perfect! Have you ever wondered why, if cacao is a fruit, you haven't seen juice made from it like apple or orange juice? I have wondered the same thing. But now, you can drink cacao juice. Repurposed Pod is the company behind this new beverage. The only ingredient is cacao juice, pressed from cacao fruit from Ecuador (cacao fruit also holds the cocoa beans that chocolate is made from). The taste of the juice is sweet, but also a little bit tangy and tart too. The acidity of the cocoa bean can be well explained when you taste this juice. I was so excited to see the juice at the Northwest Chocolate Festival this year at Indi Chocolate's table. It has been a little while since my last trip to a cacao farm and I was missing the taste of the fruit. I was surprised at how much I enjoyed the juicy fruit taste, since the descriptions had never made it sound appealing. Comments like "juicy white flesh" made me think it was going to be disgusting, however the actual taste was that of one of the best fruit I've ever had. The juice offers nutrition and a good source of magnesium, and a wonderful new flavour for your smoothies or as a base for mixed alcohol beverages. This is the next best thing to finally getting cacao pods imported to our grocery stores. I'm not sure if we can get this in Canada yet, but there is definitely a lot of distribution through the United States, where you can buy it on Amazon.com for about $3.99 per container. To learn more about Cacao Juice and the makers of this product, visit their website at: www.repurposedpod.com or on Instagram at: @repurposedpod. Fall is all about Pumpkin-spice the last 10 years thanks to great advertising by Starbucks, and more recently Tim Hortons and McDonald's with their takes on Pumpkin Spiced Lattes. But aside from the beverages, dessert is really the way to go when it comes to that flavour combination we all love. And for me, dessert usually means chocolate (unless it is pumpkin piecaken of course). I haven't quite figured out how to put chocolate into a classic pumpkin pie and still maintain its wonderful texture, so I thought perhaps a sweeter, chocolatey pie creation was in order. Playing around with the ingredients in my White Chocolate Key Lime Pie Recipe gave me a creamy pie that is simple and quick to whip up. Fast enough in fact to make the morning of any dinner, or inside of an hour the night before. So if you need a quick dessert for this Canadian Thanksgiving (yes, this weekend! ), you still can. And if you are American, this will give you lots of time to stock up on these simple ingredients before your Thanksgiving celebrations start. So let's get started. You'll be amazed at how quick and easy this pie is! 1. Pre-bake your homemade crust if using in two pie plates, or simply unwrap your store-bought pie plates and place on two pans on the counter (the pans makes it easier to put them in and out of the oven). 2. In a medium microwave proof bowl, place the 16 ounces of chopped chocolate and 1/3 cup cream. Microwave for 1 minute, remove and stir until smooth. If any lumps of chocolate remain, place back in the microwave for 10 seconds only, and stir again until smooth. Repeat as necessary until the mixture has no lumps but is not too hot to separate out the cocoa butter from the mix. 3. In a medium mixing bowl, blend together the contents of both sweetened condensed milk containers, the 2/3 cup of sour cream, and the chocolate mixture, then beat in the spices and the molasses. You can add a tsp of real vanilla too if you want to, but this is optional. Pour this into your prepared pie shells, splitting the batch evenly between both. 4. Bake in an oven preheated to 350 F for 14 minutes. Carefully remove, then let cool for 1/2 to 1 hour on the stovetop. Place in the fridge for 4 to 6 hours to chill. 1. Place the 4 ounces of chopped chocolate into a small microwave safe (glass or plastic) bowl. Add the whipping cream. Microwave for 1 minute, remove and stir until smooth. If any lumps of chocolate remain, place back in the microwave for 10 seconds only, and stir again until smooth. Repeat as necessary until the mixture has no lumps but is not too hot to separate out the cocoa butter from the mix. 2. Pour the ganache over the tarts and spread to the edges, or let set in its bowl for a half hour or so, to let cool a little, then pour into a pastry or ziplock bag, cut off a small corner and squeeze out in lines back and forth over the whole pie, then repeat the opposite way to create a criss-crossed pattern. 3. Let set in the fridge for 1/2 to 1 hour before slicing. 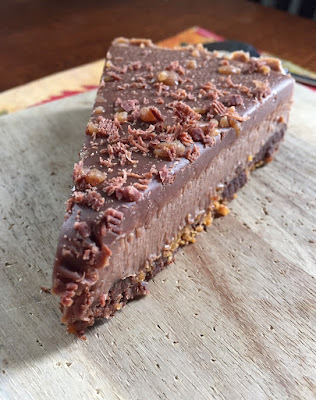 When you slice the pie, shave the remaining chocolate using a grater over the pie slices to top them. You can also sprinkle with skor caramel bits for added texture. Chocolate bars with no soy lecithin are not easy to find....but they are out there. 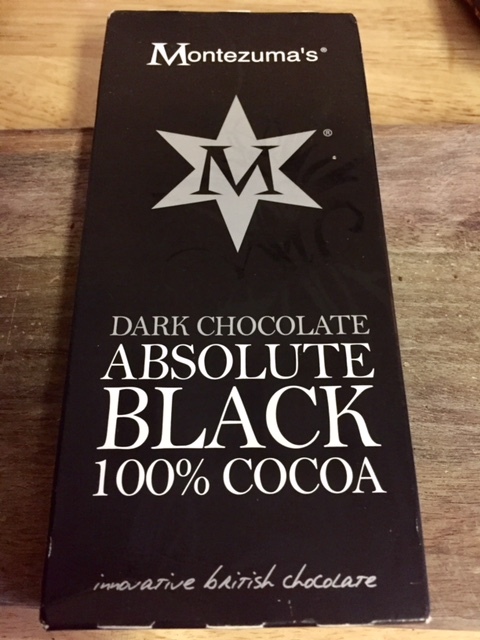 99% Dark Chocolate, Only for the Dark and Very Bitter! 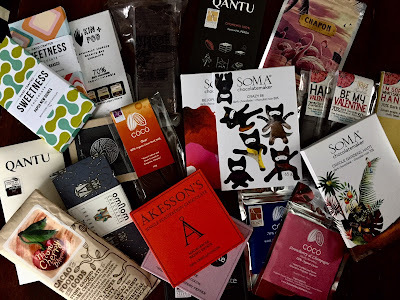 I am on a mission to taste all of the world's best chocolate, and to share what I have learned with you! As a chocolatier, pastry professional and business owner with an obsession for tasting new kinds of chocolate daily, and with creating something new in my commercial kitchen every week, I can share all sorts of tips, tricks and techniques for 'chocolatiering', bean-to-bar chocolate making, and for baking. Join me on this journey for recipes, reviews, and chocolaty gift ideas by way of my chocolate blog (www.ultimatechocolateblog.blogspot.com), my facebook page (The Ultimate Chocolate Blog), twitter (@ultimatelychoc) or Intagram (@ultimatelychocolate). And be sure to check out the web site of Ultimately Chocolate, my chocolate and pastry business (www.ultimatelychocolate.com) in Canada. Oh, and I LOVE to make Piecaken and share my recipes at www.piecaken.blogspot.com. The CacaoCookie™ is a crunchy cookie made only from organic cacao and coconut sugar (no flour), dipped in bean-to-bar organic chocolate. No eggs, no soy lecithin, no wheat. Just chocolate. 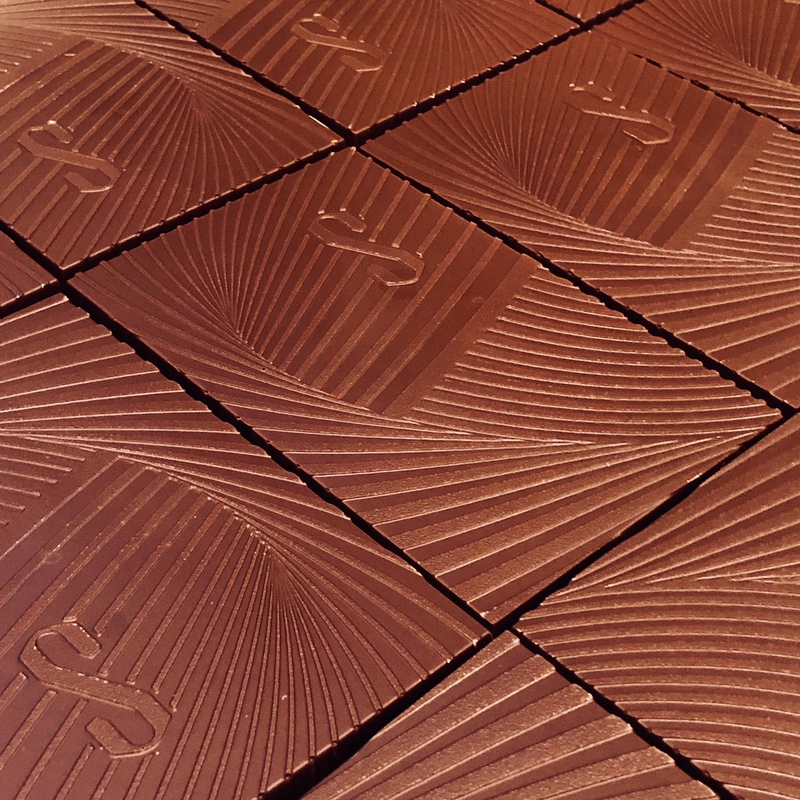 Learn more: http://www.ultimatelychocolate.com/cacaocookie.html. The chocolate TOFFLE™ is a dark chocolate toffee wrapped around a delicious milk chocolate truffle centre. It comes in Original Real Cream, Peppermint, Hazelnut and Peanut Butter.